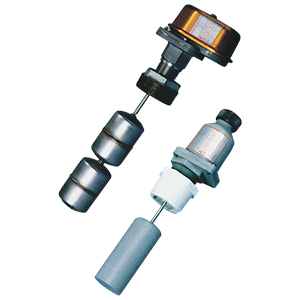 The LV-1100 and 1200 level switches feature a nonmagnetic design suitable for applications where magnetic particles (i.e., rust) are present. The LV-1100 series also features rugged metal construction and a buoyancy adjustment to allow the unit to be used with fluids down to SG (specific gravity) = 0.6. The LV-1200 series features plastic and 316 SS or Hastelloy® C construction for more corrosive applications or where the low cost of plastic construction is an advantage. Liquid Level Change to Actuate Switch: ¼"
Water Resistant Strain Relief Fitting (LV-1200): For cable diameters 0.250" ±0.025"